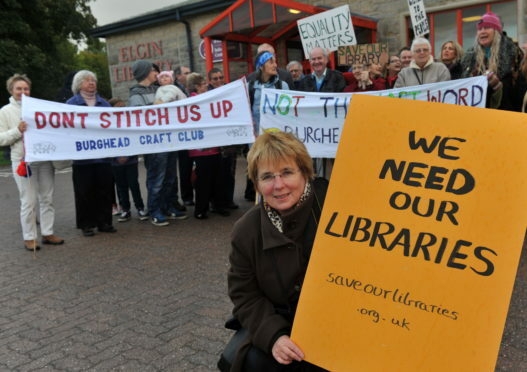 Campaigners pressed to save libraries across Moray in 2013. Campaigners marched through the heart of Elgin five years ago to try to save libraries from closure. Children wove banners pleading for the steps which Moray Council said were necessary to save more than £350,000 not to be taken. The colourful Save Our Libraries campaign was ultimately unable to save the sites in Findochty, Hopeman, Portknockie and Rothes from closure. However, it did win a reprieve for the facilities in Burghead, Dufftown and Cullen. A court bid had been threatened before the climb-down by the authority. Now those three libraries have been slated for closure once more, this time alongside Fochabers, Lossiemouth and Tomintoul in the latest wave of savings. Meanwhile, reduced opening hours have also been proposed for the sites in Buckie, Forres and Keith. Last night, Bill Davidson, chairman of Burghead and Cummingston Community Council, said the closure of the library would be a “big blow” for the village – but stressed there should be other priorities for potential campaigners. He said: “We’ll argue the toss with the library as it’s a big asset in Burghead. “The computers there are very busy. I use it myself and I know the school kids do too. “Despite that, I think libraries are well down the pecking order of what we should be looking at when you consider class sizes are going up, they’re going to stop the exercise classes in schools and there won’t be any public toilets left. Local union bosses have previously vowed to try and resist closures to Moray’s libraries – which they have described as a “vital resource” for accessing IT facilities and staging meetings, as well as for their traditional uses.